This is the Donkey In The Well Story for kids. Once upon a time, there was a farmer who had a donkey. He used to take him to the marketplace with lots and lots of wheat every day. 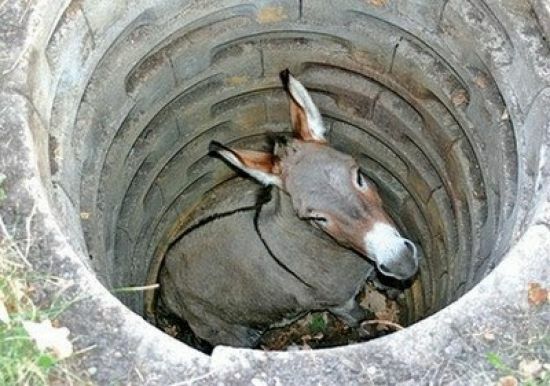 One day, the donkey accidentally fell down into an empty well. The poor donkey cried miserably for hours. The farmer thought for a while and tried to figure out what to do. The farmer was really sad at this mishappening. Also, read The Clever Donkey. Finally, he decided that the donkey was old and so he decided to cover up the donkey by shoveling some dirt on it. The farmer invited all his neighbors to come over and help him cover the old donkey. They all grabbed a shovel and begin to shovel dirt into the well. At once, the donkey realized what was happening and it started crying loudly. After some time, to everyone’s surprise, he quieted down. A few shovel loads later, the farmer finally looked down the well and was surprised at what he saw. With every shovel of dirt that fell on his back, the donkey was doing something amazing. He would shake it off and take a step up. As the farmer’s neighbors continued to shovel dirt on top of the donkey, he would shake it off and take a step up. After a couple of minutes, all the neighbors were shocked as the donkey stepped up over the edge of the well and jumped off! You may also like to read, The Miller, His Son, And The Donkey. MORAL OF THE STORY: DON’T GIVE UP EASILY. SHAKE IT OFF AND TAKE A STEP AHEAD.